Authorities executed a search warrant on Thursday morning, 9/6, at the South Jersey home of a couple who raised over $400,000 for a homeless man through GoFundMe. The Burlington County Prosecutor's Office and Florence Township Police Department were at the home of Kate McClure and boyfriend Mark D'Amico on Cedar Lane Extension in Bordentown. Burlington County Prosecutor Scott A. Coffina confirmed in a statement that there was a search warrant executed "in connection with a criminal investigation into the Johnny Bobbitt matter." 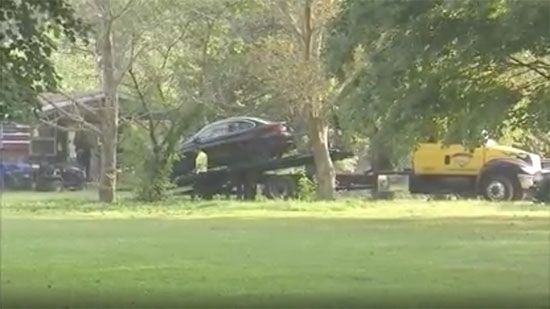 Authorities took evidence from the home and towed away a BMW. Last fall, Bobbitt spent his last $20 to buy gas for McClure who was stranded on I-95 in Philadelphia. The couple set up a fundraiser to help thank and repay Bobbitt. He filed a lawsuit last week accusing the couple of mismanaging the funds. They were ordered to turn over the money, but on Wednesday, 9/5, their lawyer said it was all gone. They have to appear in court on Monday, 9/10, to answer questions from the judge. Authorities are now looking at surveillance footage from the recent theft at the Philadelphia Insectarium and Butterfly Pavilion. Last month, the museum reported that 7,000 creatures were stolen including insects and small reptiles worth $40,000. CEO John Cambridge says it was an inside job involving five former employees. The cameras capture the employees taking the animals out of their habitats and loading them into cars. He says that the motivation is financial. There is a lucrative market for rare insects. Philadelphia Police have been interviewing some of those former employees. "We know exactly who did it. We have them on camera doing it. We know where the critters were taken," Cambridge said. "Give it back. This is not over until we get those creatures back." A man charged in a road rage shooting death of an 18-year-old high school graduate last year in Chester County pled guilty on Wednesday, 9/5, to third-degree murder. 29-year-old David Desper shot and killed 18-year-old Bianca Roberson as the two were merging from Rt 100 to Rt 202 in West Goshen in June 2017. Roberson was shot in the head. Her car veered off the road and crashed into a tree. Desper was charged with first-degree murder. Delaware County Assistant District Attorney Chris Miller said there would be a risk in pursuing the higher charge at trial in this case proving specific intent to kill. The Roberson family understands the plea and is ok with the DA's decision to pursue the lower charge. Desper faces 7.5 - 40 years in prison. Sentencing will be in December or January. Bianca had just graduated from Bayard Rustin High School in West Chester and planned to attend Jacksonville University in the fall.